New wholesale accounts are always welcome. We require no minimum orders if display racks are not required. If display racks are required, our minimum opening order is $150. To expedite first order, please provide credit card with credit references to establish an account. Contact: Email or by phone: (802) 598-5513. Please provide the following information: Company name, address, phone number, & contact person. Add a taste of Vermont to your wedding/event! 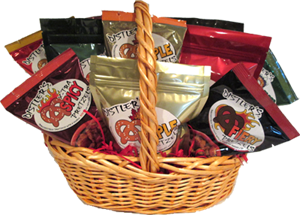 Distler’s Pretzels make a great addition to your guests’ gift bags. Please call us for special pricing on orders of 50 or more bags.